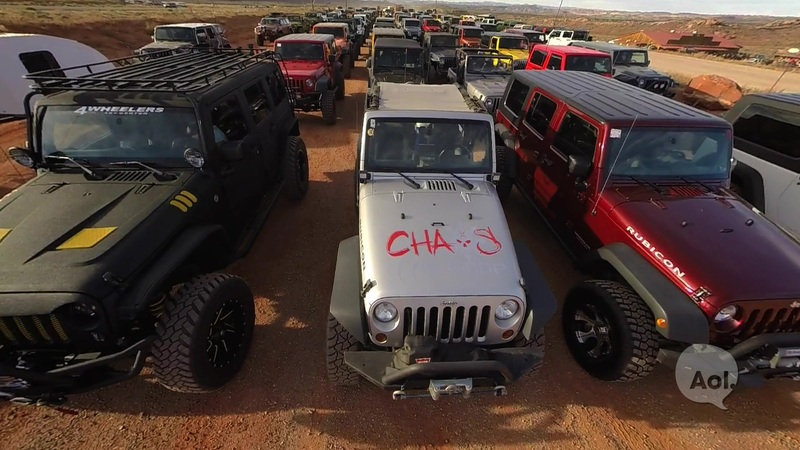 It's Easter time, and that means it's time for the 52nd Annual Moab Easter Jeep Safari, held March 24 through April 1, where thousands of off-roaders crawl, scrape and scramble over the rugged trails of Moab, Utah. 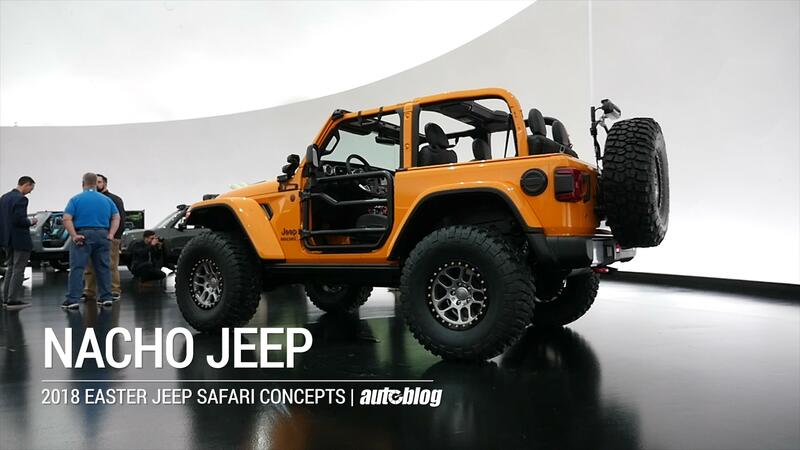 And that brings us to this year's colorful collection of Jeep concepts, custom-built by FCA for the occasion. This year's lightweight concept is meant to bolster off-road performance through extensive weight savings. It's powered by the all-new 2.0-liter turbocharged I-4 engine with an eight-speed automatic. Carbon fiber abounds — the stuff is used for the hood, fender flares and the rear tub, which also features aluminum perforated panels. It gets an "aggressively swept back" look via raked windshield, longer door openings and a custom cage. It's also 22 inches shorter with improved approach and departure angles, though the wheelbase remains unchanged. And it gets Dana 44 front and rear axles with a 4.10 gear ratio and 18-inch lightweight monoblock wheels with 35-inch tires. Inside, there's a custom instrument panel, custom seats and deleted back seats. Footwells are perforated aluminum. The 4SPEED is so much lighter than stock, it rides two inches higher. This one's inspired by Baja desert racers but can still be used as a daily driver. It gets an extreme-duty suspension system capable of both tasks. The front axle has been moved forward four inches and takes a heavy-duty longarm four-link suspension and track bar. The rear axle has been moved back two inches and gets a triangulated trailing arm four-link suspension. The longer wheelbase provides better high-speed stability. The front wheels — 39.5-inch tires on 17-inch beadlock wheels — get custom coilovers and bypass shocks that allow 14 inches of travel in front and 18 in back. 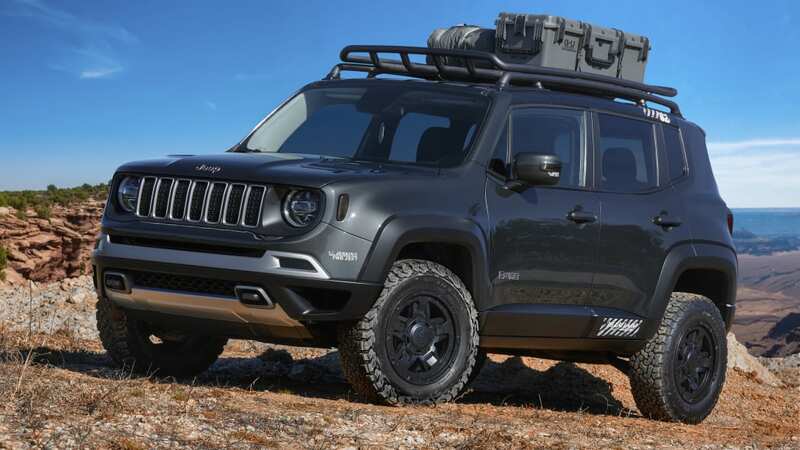 It gets Baja styling cues such as a vented carbon fiber hood, vented high-clearance fender flares and a cage with lay-down spare tire carrier. There are no exterior door handles, and the rear doors have been chopped. High-clearance tube bumpers, modified rock rails, an onboard air compressor, race-style fuel filler, KC Carbon series front auxiliary lights and a chase light complete the Baja look. Inside, a custom cage integrates the chassis, leather front seats and low-back racing rear bucket seats. 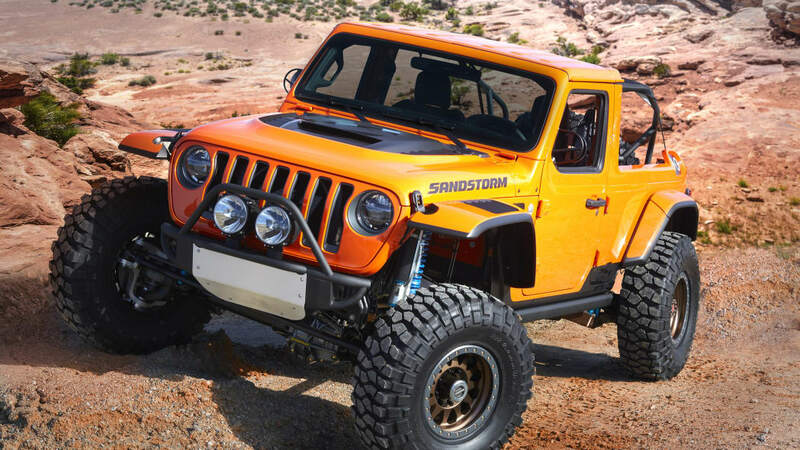 The Jeep Sandstorm is powered by a 6.4-liter V8 from the Mopar performance catalog, mated to a six-speed manual. The B-Ute is decked out with a 1.5-inch lift kit, a roof rack and rock rails. It sits on 17-inch wheels with a 30-millimeter offset, wrapped in BF Goodrich T/A Baja Champion tires. Inside are custom seats with inserts in a material Jeep calls Mineral, with touches of Carbonite and Piano Black throughout the interior in places like the shifter, speaker covers and vent surrounds. There's a MOLLE system on the back of the front seats, and Mopar all-weather mats. 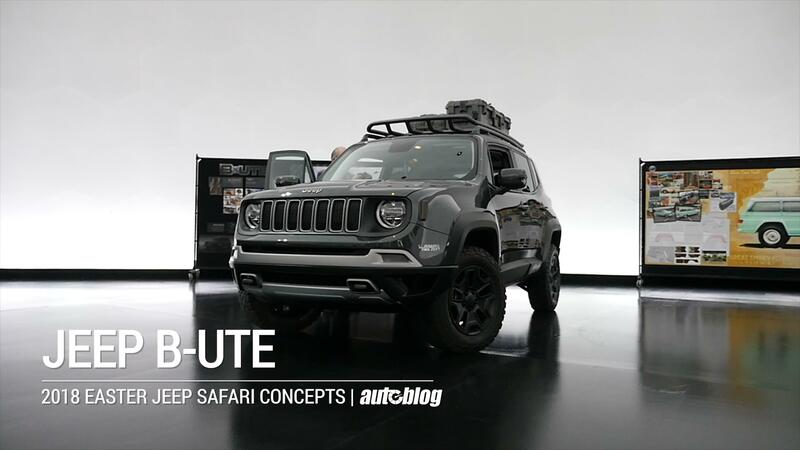 The Jeep B-Ute is powered by a 2.4-liter Tigershark engine, paired with a nine-speed automatic. Do you long for the days when clans, kith and kin, piled into their trusty family trucksters, hit the open road, and settled in for a long-haul vacation? Do you wish that small-scale sabbatical could include some serious rock crawling? 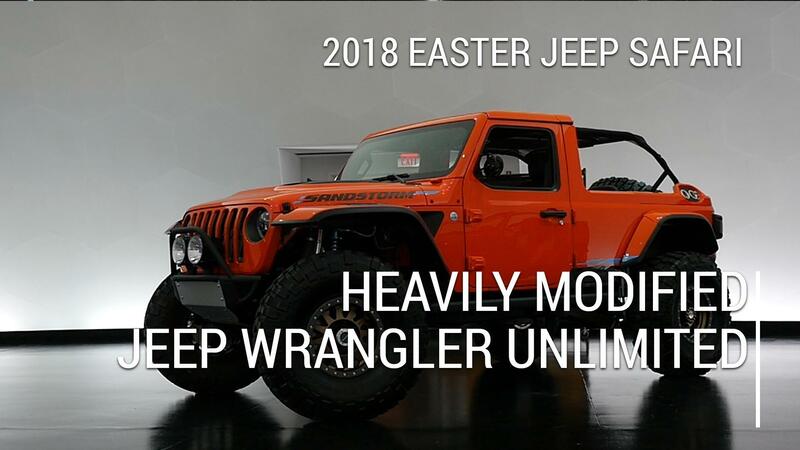 If so, Jeep has just the vehicle for you. It's called the Wagoneer Roadtrip, and it's equipped to pile on some serious miles over serious terrain. 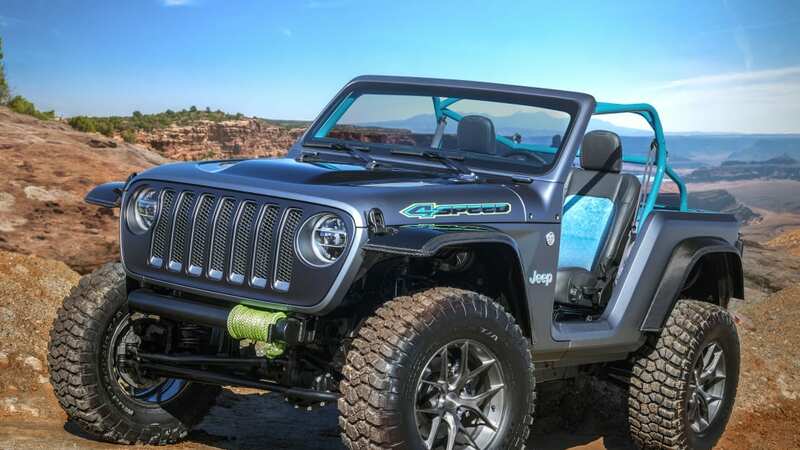 A fully boxed frame is stretched an additional five inches between the wheels, and fitted with Dana 44 front and rear lockers held up with four-link suspension bits and coilover springs. A corresponding five-inch wheelbase stretch of the 1965 Jeep Wagoneer's bodywork offers up greater interior space while still leaving room for a custom cooler fashioned from period-correct luggage. 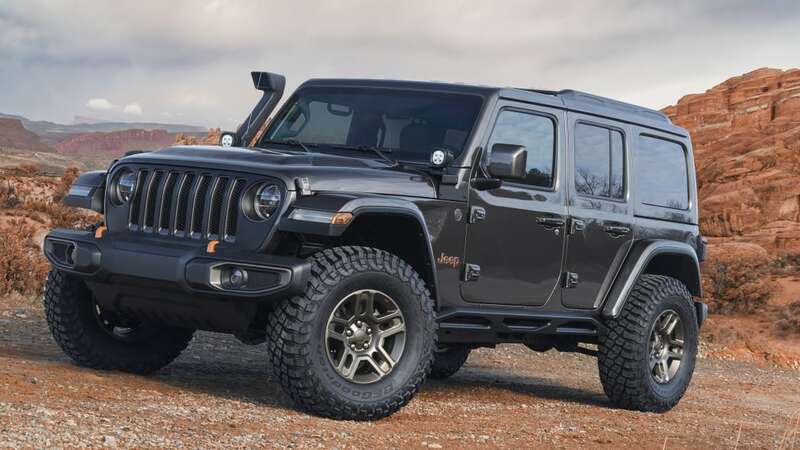 A set of 17-inch steel wheels with 33-inch BFG Mud-Terrain tires finishes off the look. The old-guard Wagoneer was build between 1963 and 1991, and its value has skyrocketed in recent years right as the modern family's focus shifts from midsize sedans to midsize crossovers. 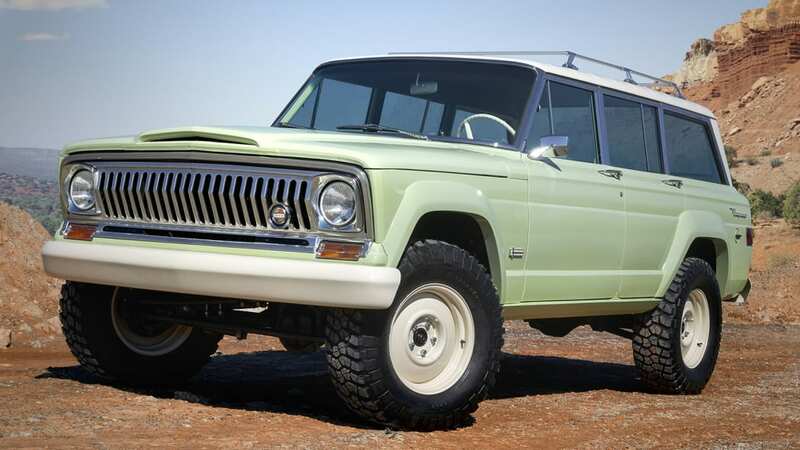 But this — the original family SUV and the first Jeep fitted with an automatic transmission — is something different entirely. Sure, the original 230-cubic-inch Tornado inline-six has been swapped with a modern 5.7-liter Hemi, but the charm of the original is fully intact. 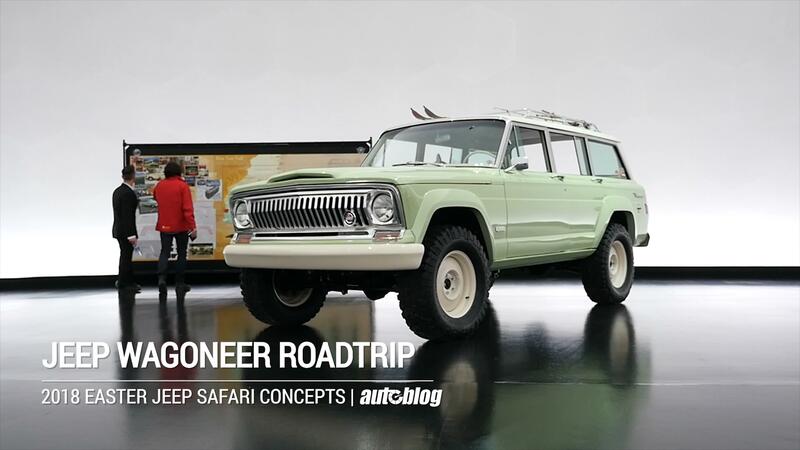 There's a new Wagoneer on the way, and it's going to have to be great to live up to the legacy set by the original, highlighted by this Wagoneer Roadtrip concept debuted at the 2018 Moab Easter Jeep Safari. 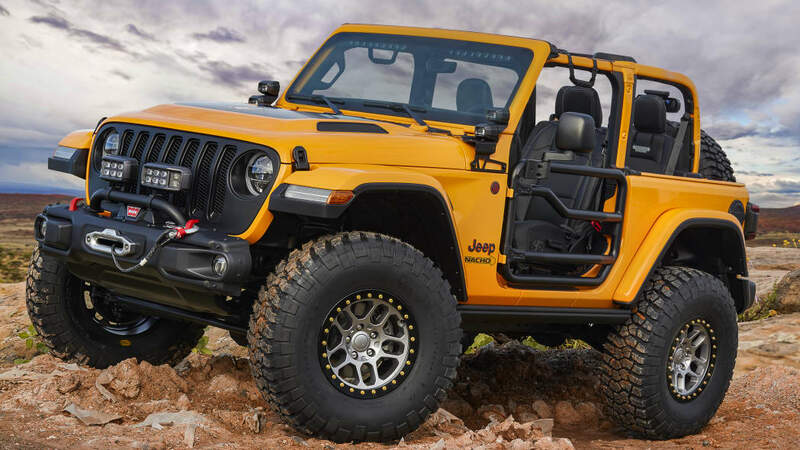 The so-called Nacho Jeep gets its name from the Nacho yellow paint scheme. But its purpose is to show off the full breadth of the Mopar brand's Jeep Performance Parts catalog. A two-inch lift kit featuring 2.5-inch-diameter aluminum shocks is straight from the catalog's pages, as are the satin black grille, Warn Winch kit, lighting brackets to hold up the brush guard's LED lights, and header-mounted trail lighting kit. A husky set of rock guards, two-inch round-tube doors, a spare-tire hinge reinforcement kit, and black-finish fuel door round out the exterior changes, all set off by the fluorescent hue. A black leather Katzkin seats with light tungsten stitching prove Jeep didn't forget to liven up the interior. A cold-air intake is all that's added to the 2.0-liter turbocharged four-cylinder engine. Like what you see from the Nacho Jeep? Well, the name — Nacho sounds like Not Yours, get it? — doesn't reflect reality. 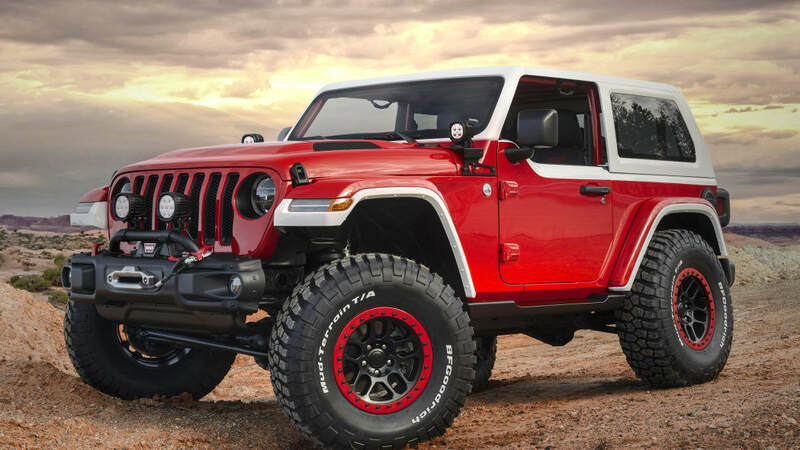 The only thing a Wrangler owner with a deep pocketbook for accessories couldn't replicate out of the JPP catalog is the custom satin-carbon finish of the wheels. 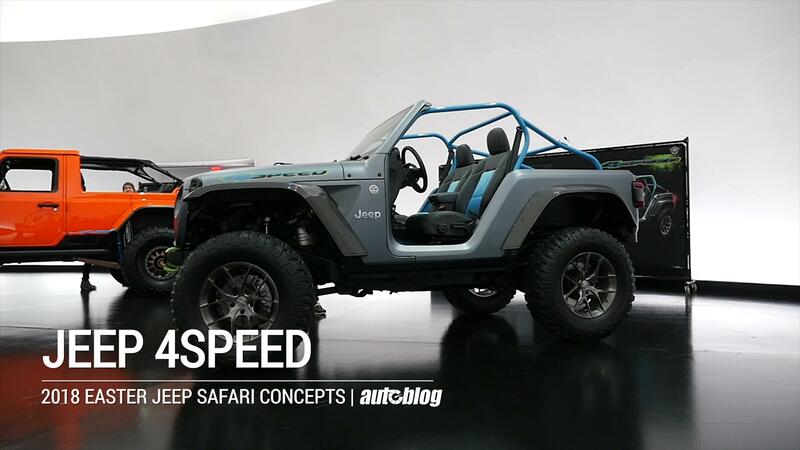 This Jeep Wrangler Sahara-based concept is where the city meets the trails. 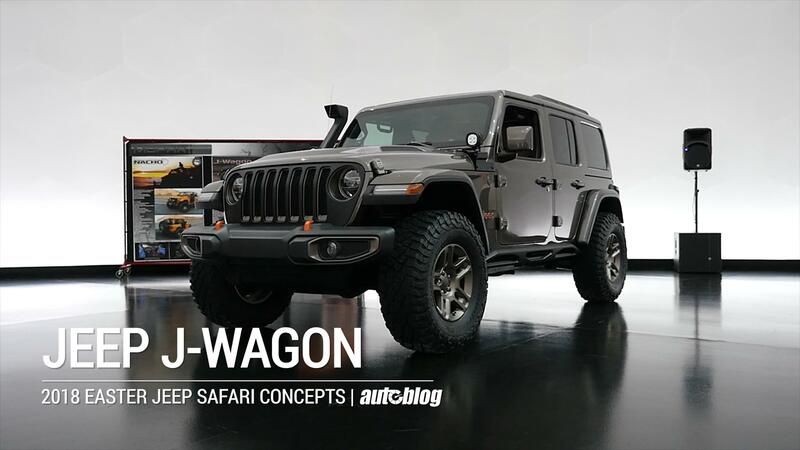 Jeep designed this one to be the best of both worlds, adding a snorkel, extra cabin sealing and five-inch LED off-road lights to cast out "military-grade illumination." Design elements include a black Mopar grille, bezel body trim and Brass Monkey-styled 17-inch wheels. The look is set off with orange accents on some of the badging and the tow hooks. 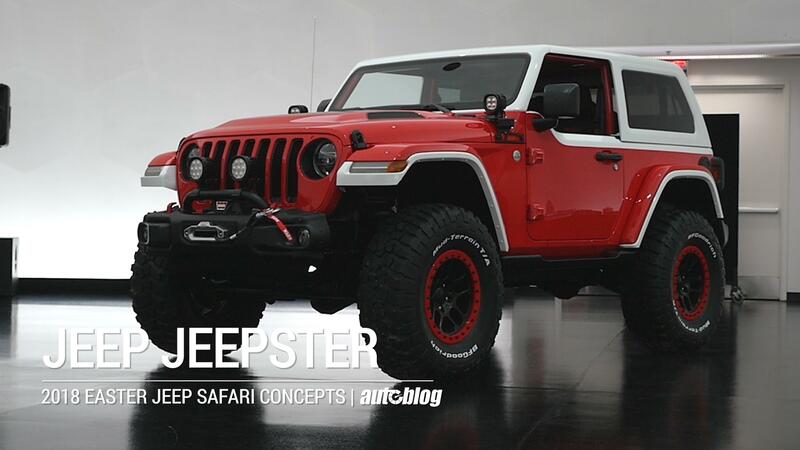 The 1966 Jeepster lives on in this retro-inspired concept built around a Jeep Wrangler Rubicon. Visually stunning, this Jeepster has a Firecracker Red body and Bright White hardtop, Bright White fender flares (quite the paint names) and a tri-color Jeepster badge. It's chopped two inches and has a custom windshield that's raked back 2.5 inches. It rides on a two-inch lift kit and 37-inch BF Goodrich KO2 tires and 17-inch wheels. The interior has a roll cage, black leather seats and the spare tire carrier. In back are custom storage packs for food, gear and tools.